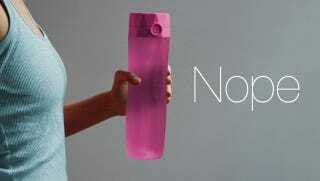 Kickstarter is obsessed with trying to make things smart: just add Bluetooth, and you get smart locks, stoves, ovens, kettles, and now, water bottles. Because apparently, you are literally incapable of drinking unless you have a buzzing thing telling you to hydrate, every second of every day. Normally, I try and avoid bad crowdfunding projects altogether: don’t water the dumb idea, so the saying goes, and it will wither and die. But smart water bottles refuse to do so. There are two projects begging for money on Kickstarter right now; a cursory Google search throws up two more (unsuccessful) crowdfunding campaigns from the last few years. The product being peddled by every one of these campaigns is the same: a water bottle that tracks your consumption of water, and squawks or buzzes or otherwise annoys you when you’ve not met your ‘hydration goal’. This is necessary because, as Trago points out, “optimal hydration is both art and science”. And it’s true! How much water you should drink varies on your weight, activity level, surrounding temperature, and how much fruit you had for breakfast. Thankfully, humanity has evolved this wonderful thing called ‘thirst’, which is your body’s way of telling you to drink some goddamn water. For pro athletes and mere mortals alike, it’s consistently pretty freaking accurate, coming with glowing recommendations from the likes of Harvard Medical School — which, I notice, has yet to endorse one single stupid Bluetooth-connected water bottle. This, of course, leaves aside the fact that a Kickstarted smart water bottle will need charging, probably break, almost certainly not ship to you on time, and cost $40 more than the reusable water bottle you should really be buying. Some things are probably better smarter: door locks, perhaps; printers, certainly. A plastic drinking vessel is not one of them.